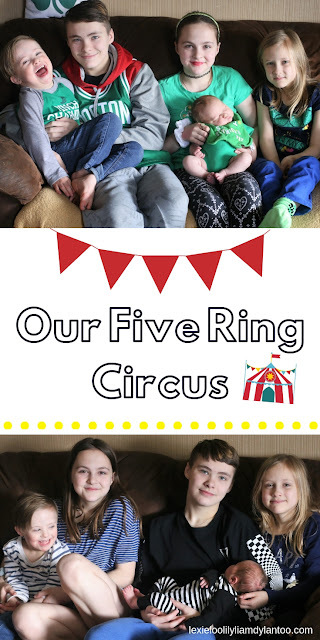 Welcome to Our Five Ring Circus! After 10+ years of some form of Lexie Loo & Dylan Too, it was time to bring some changes to my blog. It took a lot of thought (literally months), and it's a work in progress, but I feel like this new name fits this season of our lives so perfectly! Back in 2008, I started this blog simply because I wanted to keep family members and friends updated on what we were up to, and to journal life with our two kids, Dylan and Lexie. Lexie Loo & Dylan Too was the perfect name at the time. When Lily was born, I changed the name to Lexie Loo, Lily Boo & Dylan Too. By the time Liam came around, my blog was already well established, and I didn't want to "re-brand" so it became Lexie Loo, Lily, Liam & Dylan Too. When we found out that baby #5 was on the way, I did start to contemplate what I was going to do with my blog. Pregnancy is very tough on me, and I knew my time was going to be limited with a newborn and juggling five kids, but I didn't want to give up blogging completely. It was tough to realize that I was only able to post a few times a month, but I decided to give myself grace, and do what I could, when I could. Making the decision to change my blog name was a difficult one. After over a decade of blogging, I was attached to the name, and it almost felt as if I was abandoning it. Plus, I collaborate with a lot of agencies and companies, and re-branding my blog was going to be a huge undertaking. But when I finally added Coen's name to my blog name and social media accounts, it just looked ridiculous! As much as I hated to give it up, I knew the time had come. When it came to changing the blog name, I had a few ideas in mind. Although this is definitely a blog about motherhood and life with littles (and that isn't going to change), I want to focus a bit more on big family living and Down syndrome. I was considering using Down From Heaven With (Forty) Seven, which was a play on the number of people in our family AND having a child with Down syndrome (47 chromosomes). I thought it was perfect, but Grant didn't think many people would get it! So...back to the drawing board. Last Saturday, the name came to me out of the blue, and it just felt right! 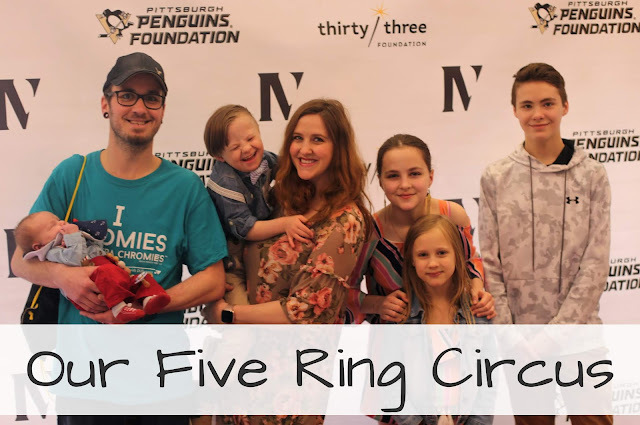 Life with four kids, including one who has special needs, was already busy enough, and adding a newborn to the mix really made life chaotic. Every time we left the house, Grant or I would joke that we're like a traveling circus. I had been using the hashtag 4ringcircus for years, and when Coen arrived, I changed it to 5ringcircus. Carrying that over to the blog just made sense! Whether we are at home or on the go, life with five kids is a juggling act. There is always something going on, and there is never a dull moment! We always have at least one crazy story to share at the end of the day, and quite a few wins and fails. My husband and I are the ringmasters, our kids are the five acts, and there are a few appearances by a giant dog! Our lives really are like a five ring circus, with five (or more) acts going on at once! As I mentioned before, it is a work in progress! I managed to change my blog name, and change my name on Instagram and Pinterest. I'm starting to update social media profiles, and waiting for my facebook page name request to be approved. Twitter can't be changed, but I'm sticking with it since it took me forever to reach thousands of followers. I need to update my blog design, my profile, and and the About page. And then comes the website change, and updating my info with all the agencies I work with. With everything going on, it's going to take weeks (if not months) to completely finish re-branding, but it's something that needs to be done! So what does all of this mean for my blog? Well, not that much! It's just an update and a few small changes. My honesty about motherhood and life with Down syndrome will remain, and I will never stop sharing my family, since that's why I started blogging in the first place. But I do hope to share more lifestyle posts - recipes, fun kids' activities and crafts, fitness, fashion, books, pets, DIY, home decor, big family living, and more! I've been working hard on some new content, and have a few fun posts coming up. There just might be an awesome giveaway or two, as well! Now that I'm getting more sleep and can focus enough to form a complete sentence (most of the time), and remembered how to work with a newborn attached to me, I'm eager to get back into blogging regularly and completing my blog re-brand! Letting go of Lexie Loo, Lily, Liam & Dylan Too was a very hard choice, but it was time to make the change. The name no longer fit my blog or our family - I mean, Lexie Loo, Lily, Liam, Coen & Dylan Too was a bit much. Even though the name has changed, our family is very much the same - just bigger! So welcome to OUR Five Ring Circus! Enjoy the show! These pictures are so cute. And I love the new blog name! I'm sure switching everything over will be annoying, but it'll be great when it's all finished and read to go! Stefanie, I love the name of your blog! I can understand how changing its name can be quite the undertaking--work-wise and emotionally. I remember all of your blog names, starting with the first--Lexie Loo and Dylan Too. Back then, you had two kids and I had one. Now I still have one kid, and you have five!! Every time I read your blog, I'm in awe of the energy, patience, and joy that you bring to parenting. Your children all know what it's like to be treated special and yet they also know how to share and enjoy each other. Congrats on your new name, but most importantly, on your new sweet baby. Definitely give yourself some grace about blog posting and just enjoy and savor the moment. Love to you!! It sounds great to me!